Bastardogs are one of these strange glam revival bands that bring a lot to a genre that many once cast aside and called frivolous. These Genova natives have crafted something exciting and new with their record No Pain No Gain. A record that seems to fuse the sounds of obscure New Wave of British Heavy Metal stalwarts with some hard hitting classic glam, this is glam for a new generation, heavy, melodic, and of course, a blast to listen too. 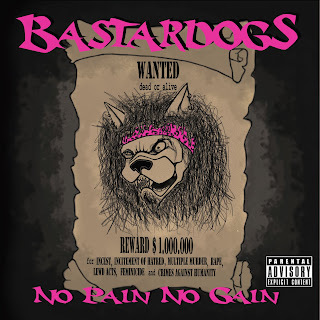 Suffice to say, with No Pain No Gain it is impossible to call Bastardogs a mere revival band, but rather an evolution on the music of the lords of the genre. Part of the appeal of Bastardogs is the heavily reverbed vocals, they have a wild and triumphant quality which fills the music up with a vitriolic energy. Bastardogs spit acid into the face of posers and will have no truck with those who can't appreciate their mountains of hair. The riffs on No Pain No Gain are simply stellar. They have a lot of wonderful roaring parts that demonstrate a true understanding of glam as a genre. Yet this is not the only thing that defines the Bastardogs sound. The band plays with a stunning desperation and searing majesty that evidences the groups ability to roar out of the gutter and onto the stage. This is sleaze metal at its finest, dirty, grimy, and ready to rock. A band who have no difficulty fusing the grit of Motorhead with the slime of W.A.S.P. Bastardogs have gone out and proved themselves as rapidly rising metal gods with No Pain No Gain. Not just music for dudes stuck in the 80's. Bastardogs have an incredible forward thinking sound rife with stunning riffs and flashy guitar licks. Tease your hair out boys and stick on the spandex, Bastardogs are sleaze metal for you and me, folks who never experienced the 80's glambangers. This band will tear your skull open and stuff it full of glitter, prepare your body.